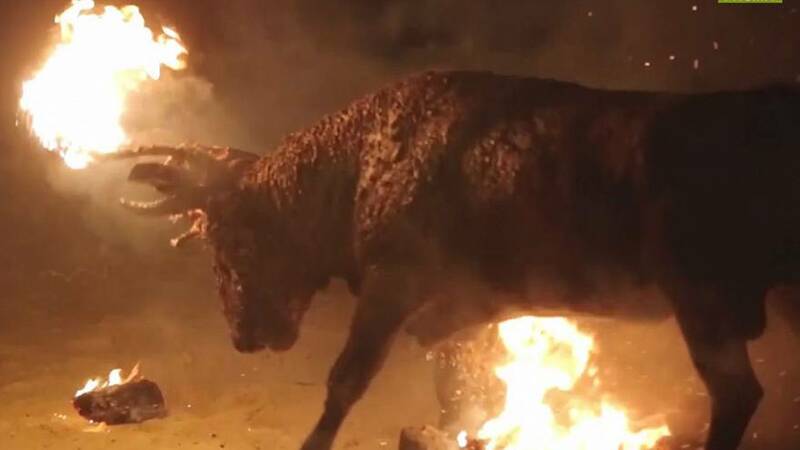 Video released by PACMA, a Spanish political party focusing on animal rights, shows a bull being set alight at a festival in the Spanish town of Medinaceli. During the Toro Júbilo the creature is covered in mud, then a wooden frame is attached to its head and set on fire giving the impression of flaming horns. This goes on for an “excruciating 13 minutes of torture”, according to the campaigners. The bull goes on to thrash around in what appears to be an attempt to extinguish the flames. The event near Soria in Castile and Leon region, 150 kilometres northeast of Madrid, goes on for two hours. According to the animal rights group, the local authority in Medinaceli had prevented journalists from covering the event, allowing in only people who had been invited. In spite of the restrictions, PACMA was able to record the mistreatment of the animal as those present yelled insults about anti-bullfighting campaigners. It says that after its ordeal, the bull would have been sent to an abattoir in line with local regulations. The campaigners call for people to revolt against such festivals which it argues should be banned, pointing out that public pressure had succeeded in stopping barbaric practice at another bullfighting event – the Toro de la Vega. The local mayor has said the tradition will go on as long as the people of Medinaceli want it to continue. The Toro Júbilo has been protected by the Castile and Leon regional council for the past 14 years as an event of regional touristic interest.